The Eugarie (also known as the Common Pipi) has a triangular bivalved shell with one short side. This mollusc has a glossy shell that can grow to 6 cm across, and can range in colour from white to green, brown, purple, mauve, yellow or orange. 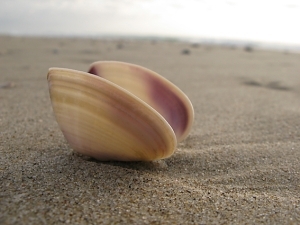 It is a very common shell on surf beaches, living just below the sandy surface. Often, the tips of its siphons can be seen slightly protruding above the sand. The Eugarie will move up or down the beach depending on the tide. Dead and broken shells of this species are a common feature on the shoreline. An edible species, the Eugarie is frequently used as bait, and bleached, weathered shells can be found in large numbers in Aboriginal midden heaps.